Completed in 1977, the Sanso Villa, or "reception house," was the last of 13 buildings George Nakashima designed for his property in New Hope, Pennsylvania. He spared no expense in the space, which was used to host guests and hold dinner parties, incorporating rare woods and lavish materials throughout. 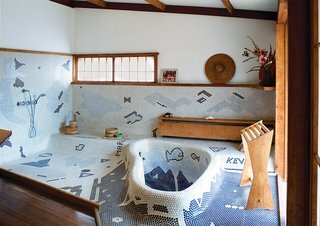 Aware of the looming late-1970s energy crisis, he also wanted a structure that did not depend on fossil fuels and purchased a wood-fired boiler from Japan to heat water for his playful interpretation of a traditional soaking tub in the bathroom. Start a public conversation on this article by adding your comments below.